[prodDesc] => Our small spatula helps you get the last little bit out of slightly smaller jars and bowls. Made in Portage, Wisconsin of natural beech wood and silicone rubber, which has been heat tested to 800 degrees Fahrenheit, it's stain resistant, dishwasher safe, and is FDA approved. 10-3/4" long x 7/16" wide. 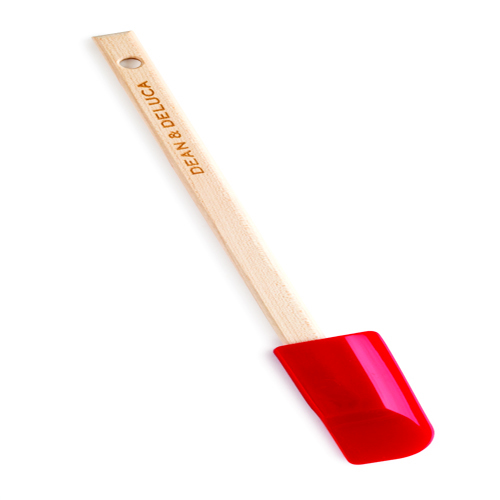 Our small spatula helps you get the last little bit out of slightly smaller jars and bowls. Made in Portage, Wisconsin of natural beech wood and silicone rubber, which has been heat tested to 800 degrees Fahrenheit, it's stain resistant, dishwasher safe, and is FDA approved. 10-3/4" long x 7/16" wide.